There are 0 registered and 56 anonymous users online. The RobotCub research is primarily described in our scientific publications many of which can be downloaded in PDF format. A short summary of research will be published here after the next review meeting. 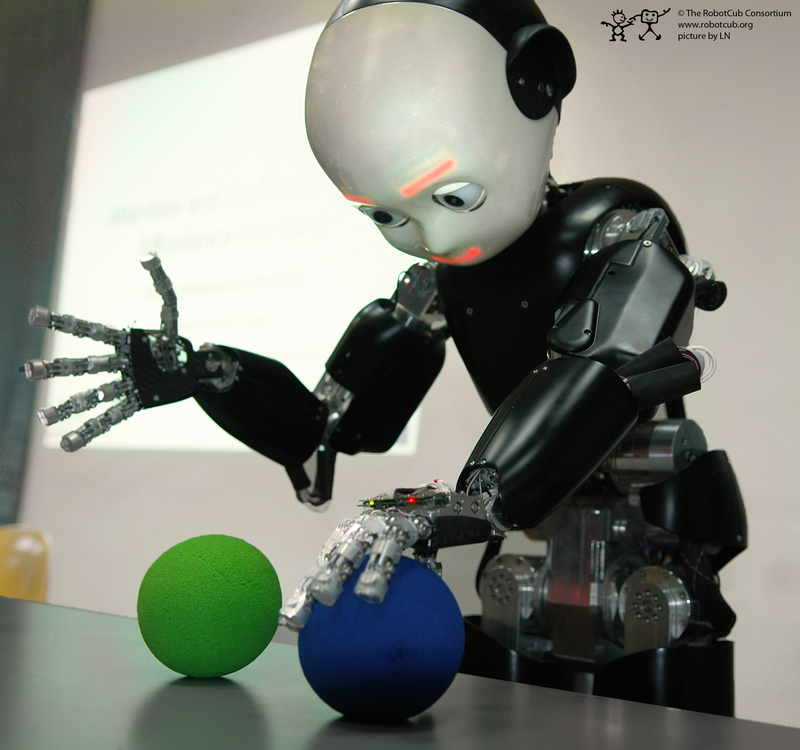 RobotCub research involves the design of a cognitive architecture for the iCub : an open-systems 53 degree-of freedom cognitive humanoid robot. At 94 cm tall, the iCub is the same size as a three year-old child and is designed to be able to crawl on all fours and sit up. Its hands will allow dexterous manipulation, its head and eyes are fully articulated, and it has visual, vestibular, auditory, and haptic sensory capabilities. RobotCub's approach is enactive, highlighting the requirements for phylogenetic configuration, the necessity for ontogenetic development, and the importance of humanoid embodiment. In  we detail the iCub cognitive architecture, addressing the iCub phylogeny, i.e. the robot’s intended innate abilities, the modulation of these skills by circuits inspired by the functionality of the hippocampus, basal ganglia, and amygdala. The architecture also include a prospective ability whereby sensorimotor behaviours can be simulated and then used to influence the action selection in the basal ganglia. We conclude by outlining our scenario for ontogenesis based on human neo-natal development. 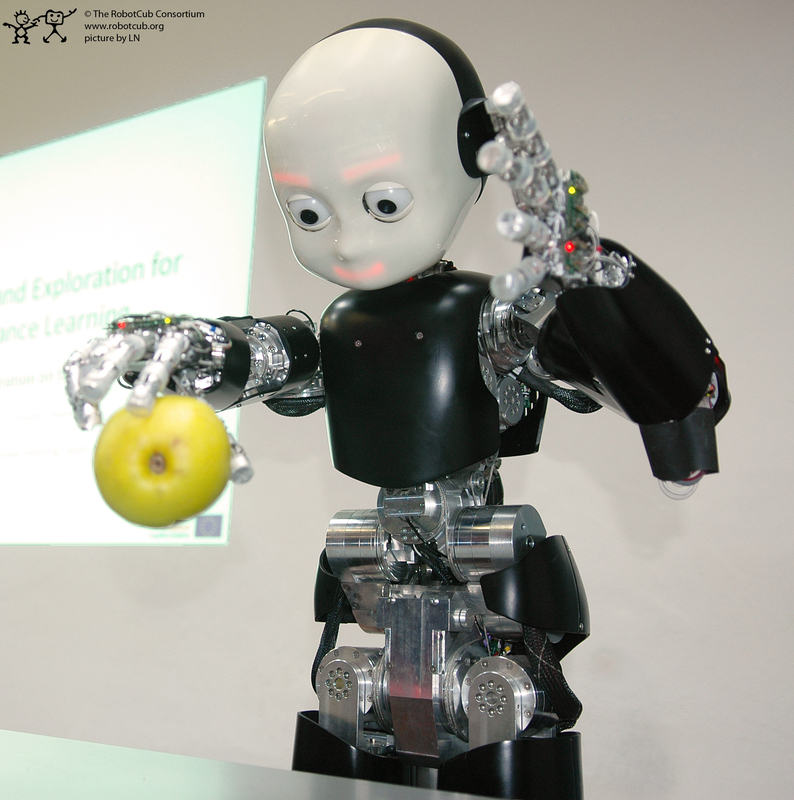 RobotCub is a research project dedicated to the investigation of cognitive systems through the ontogenic development of a humanoid robot. That is, it is a programme of enquiry into emergent embodied cognitive systems whereby a humanoid robot, equipped with a rich set of innate action and perception capabilities, can develop over time an increasing range of cognitive abilities by recruiting ever more complex actions and thereby achieving an increasing degree of prospection (and, hence, adaptability and robustness) in dealing with the world around it. Cognitive development involves several stages, from coordination of eye-gaze, head attitude, and hand placement when reaching, through to more complex -- and revealing -- exploratory use of action. This is typically achieved by dexterous manipulation of the environment to learn the affordances of objects in the context of one’s own developing capabilities. Our ultimate goal is to create a humanoid robot -- the iCub -- that can communicate through gestures simple expressions of its understanding of its environment, an understanding that is achieved through rich manipulation-based exploration, imitation, and social interaction. with the goal of identifying the most appropriate system phylogeny and ontogeny. The neurophysiological and psychological models of some of these capabilities are then explored, noting where appropriate architectural considerations such as sub-system interdependencies that might shed light on the overall system organization. The last two parts cover the current models that the RobotCub partners are working with. We place them in a two-dimensional space of ontogeny, spanned by actions and prospective capabilities, that is traversed by a cognitive system as it develops from its initial phylogenically-endowed state towards greater cognitive ability, such as imitation and communication (and, by extension, deliberation and reasoning). Finally we present a roadmap that uses the phylogeny and ontogeny of natural systems to define the innate skills with which the humanoid robot must be equipped so that it is capable of ontogenic development, to define the ontogenic process itself, and to show exactly how the humanoid robot should traverse the two-dimensional space of ontogeny. The conclusions set out an agenda for subsequent research and addresses the creation of an architecture for cognition: a framework for operational integration of discrete capabilities and the challenge of theoretical unification of distinct models.